A Mariner East 2 construction site in Lebanon County. Sunoco says it expects to have the pipeline in service by the end of the second quarter, 2018. Long forecast that ME2X, a second pipeline that will run parallel to Mariner East 2, will be completed by mid-2019. ETP President Matt Ramsey said the company has completed 62 percent of the horizontal directional drilling (HDD) sites that are required to place the line into service. The company has approval from the Pennsylvania Department of Environmental Protection to proceed on 24 other drill sites, while another 16 await approval. Asked whether he expected the construction schedule to slip because of regulatory delays, Ramsey said the company has a “good working relationship” with DEP, and the two sides meet weekly to discuss outstanding ME2 issues. In its Jan. 3 order halting construction, DEP accused Sunoco of “egregious and willful violations” of two environmental laws and the permits that were based on them, and said that any enforcement action short of the shutdown would not persuade the company to comply. Some observers said the unchanged construction schedule may not be a surprise because Sunoco probably expected progress to slow during cold weather when frozen ground makes it harder to drill and dig. Therefore, the DEP-ordered shutdown from Jan. 3 to Feb. 8 likely didn’t force the company to rethink when the project would be completed. But the company is still required to meet a long list of DEP requirements to comply with the 34-page consent agreement that ended the shutdown, and those conditions may still make it hard to start operating the pipeline by the end of the second quarter, said Rich Raiders, an attorney who represents several pipeline opponents. A Sunoco document submitted to DEP as part of its conditions for ending the shutdown shows some 800 locations where work was still needed as of Feb. 8 when the consent agreement was signed. A Sunoco spokesman did not immediately respond to a request for comment. Alex Bomstein, an attorney for the environmental group Clean Air Council, which has led legal challenges to Sunoco over the last year, said completion by the second quarter seems like a stretch. 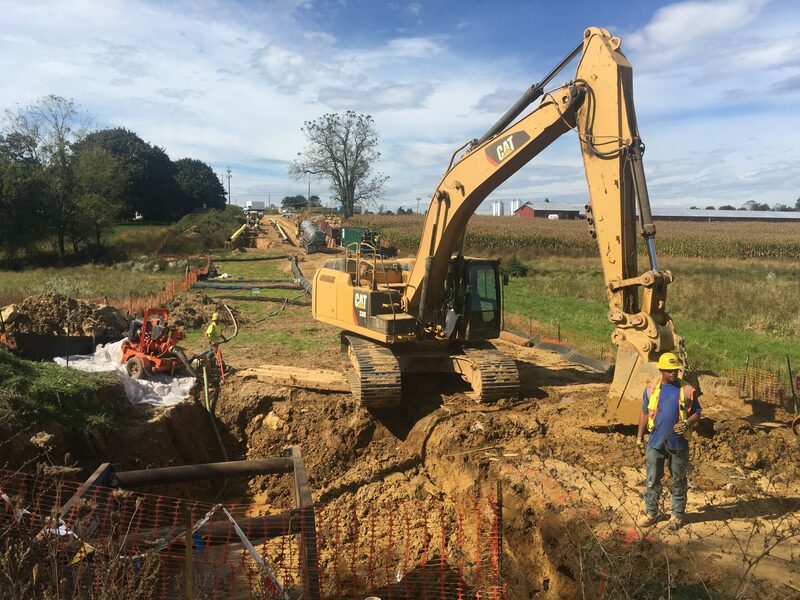 Last summer, Sunoco was ordered by Pennsylvania’s Environmental Hearing Board to re-evaluate the geology at dozens of drill sites along the 350-mile line after many spills of drilling fluid and disruption to private water wells in some places. The company must obtain DEP permission to restart drilling for the natural gas liquids pipeline at those sites. During the earnings call, ETP’s Ramsey said the company will be able to meet regulatory requirements by the end of the second quarter. “We are still under court-ordered deadlines that we have to adhere to and they have to adhere to but I think our progress is good, so I don’t see a change in the timelines from what we have given you before,” he said. But State Sen. Andy Dinniman (D-Chester County), an outspoken opponent of the pipeline, said drilling continues to cause problems in his district. He said in a statement Thursday that Sunoco should not be drilling in the area because of its “karst,” a geological formation that contains gaps, ridges and fissures in the underlying limestone, where Sunoco is restarting its drilling following the end of the construction shutdown. “The current administration is letting a pipeline company resume drilling in an area that is known to be geologically problematic,” he said. Community opposition to the project suffered a setback this week when an appeals court rejected an attempt by Chester County’s West Goshen Township to enforce an ordinance that could have required Sunoco to build the pipeline further away from homes. When operational, the pipeline will carry ethane, propane and butane from southwest Pennsylvania to a terminal at Marcus Hook near Philadelphia where most of it will be exported.